President Obama meets with U.S. 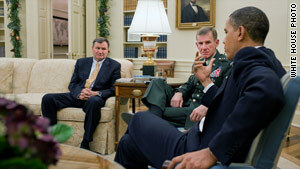 Ambassador to Afghanistan Karl Eikenberry, left, and Gen. Stanley McChrystal on Monday. Washington (CNN) -- President Obama met with his top officials in Afghanistan on Monday to reiterate what is needed for the success of the troop surge he ordered, while the Pentagon announced the first U.S. forces in the surge will deploy later this month. Obama met Monday afternoon with U.S. Ambassador to Afghanistan Karl Eikenberry and Gen. Stanley McChrystal, the commander in Afghanistan. Obama intended to reinforce the strategy and goals he announced to the American public last week, White House Press Secretary Robert Gibbs said before the meeting. McChrystal and Eikenberry are scheduled to appear before both the Senate and House Armed Services Committees on Tuesday. Meanwhile, the Pentagon said 1,500 troops from an infantry battalion task force at Camp Lejeune in North Carolina will head to Afghanistan this month as the first step in the total deployment of 30,000 more troops the president announced. Another 14,500 troops will deploy by the end of spring, including an additional 6,200 Marines from Regimental Combat Team-2 at Camp Lejeune; 800 from I Marine Expeditionary Force at Camp Pendleton, California; 3,400 troops from a Brigade Combat Team of the 1st Brigade, 10th Mountain Division from Fort Drum, New York; and 4,100 support forces, according to the Department of Defense. In announcing the surge, Obama also said his strategy includes plans to begin withdrawing the additional forces from Afghanistan as soon as July 2011. "Now it is up to the commanders on the ground and others to implement the strategy the president laid out," Gibbs told journalists. Gibbs said Obama would reiterate to Eikenberry and McChrystal "what he's told the American people, and quite frankly, what he told them on the secure video teleconferencing: ... all of what has to go into and all of what is necessary to make this plan succeed." "I think you've heard from Gen. McChrystal and Ambassador Eikenberry that they believe that this is both the right strategy and has the resources to succeed," Gibbs said. "Obviously, people can come to different conclusions, but the president made his decision based on that." Gibbs also said the July 2011 date for beginning a withdrawal is firm, though the pace of bringing troops home would depend on conditions in the region. "It could happen earlier, sure. It won't happen later," Gibbs said to repeated questions on whether the date to start the withdrawal is firm. "The president is quite clear on this."